Learn about the various tools available to you in the Numetric Roads environment. Saving allows you to save your query, analysis, or other filters. Saving does not preserve map views, chart configurations, table columns, or other setting-level items. Sharing allows any other user to see your query. A query can be shared as read-only or with edit permissions. The following video provides a quick introduction to saving and sharing. The Settings menu in the sidebar provides various setting options relevant to the current application and views. For details of what settings are used in each tool, please review the detailed section for that tool. The Quickstats menu in the sidebar provides charts and key values relative to the data being viewed. Charts can be clicked on to apply filters. 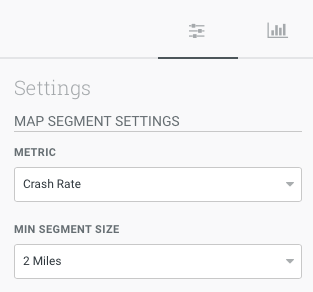 Map navigation is the same as any typical map interface. You can zoom in/out, pan the view, and switch between map and satellite view. The filter bar allows you to quickly apply filters to your data with simple free-text entry. The filter bar will suggest options based on what you have typed and you can select from the list. Individual filters can be removed by clicking the small x next to the filtered item. All filters can be removed by clicking the larger x at the end of the filter bar. Charts can also be used to apply filters. Hovering on a piece of a chart will show a tooltip (pop-up) that indicates what that piece of the chart represents. Clicking on that chart will add that specific data field to the filter bar and filter the data accordingly. The filter can then be removed by clicking on the chart again, or clicking the ‘x’ next to that attribute in the filter bar. Filters exhibit “and” behavior when the attributes are from different fields. 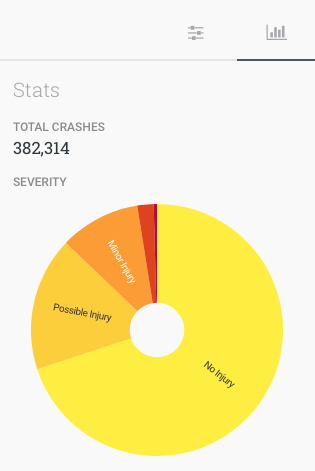 For example, if I filter by “Fatal” and “Head-On”, only crashes that included a fatality and experienced a head-on manner of collision will be shown. Filters exhibit “or” behavior when the attributes are from the same field. For example, if I filter by “Rear-End” and “Head-On”, both of which are from the manner of collision field, crashes that were Rear-End or Head-On will be shown. We currently do not allow the user to change this behavior.